2P START! Live! : Happy Brawl Day Edition | 2P START! Super Smash Bros. Brawl is finally here and it would be wrong to discuss anything else! 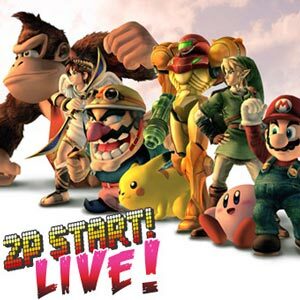 So get ready for a Brawl-tastic edition of 2P START! Live! with Ray and Tim’s first impressions of the game as well as some minor gripes in the form of the Black Doom Award. So peel yourself from Brawl for a few minutes and tune in! Hey fellas. I’m pretty positive that that tune is from the original Super Smash Bros., when you’re playing the target test. Good choice, especially for this week! Actually, I think that that’s the platform test from Super Smash Bros. I could be wrong, but it might give me an edge on the competition. Aha! I totally forgot platform test even existed! Wow, it’s been a real while. Anyway, good luck to you! Perhaps you are right. Where are Ray’s comments of the week coming from? Three minutes is just not long enough! I understand that it has to save the replay every time, because you don’t choose until afterwards whether it saves the replay or not, but you should be able to choose ahead of time to record and then fill up the SD card. Looking forward to getting into stage builder today. Is the trivia from last week from Super Monkey Ball 2 ? And I have to say that I really enjoy the new Coin Launcher game. I think everyone on 2pstart should put their 2pstart usernames in thier comments on their brawl profile, so we can know who were playing against. I hate Fox’s new voice, I liked his old one, accent and all; he doesn’t say “come on!” the same anymore T_T . Menu looks like Kirby Air Ride, darn old people menu’s >.< . And I agree about the secret characters, although it brings more people in, having new people available from the get go; and it makes your first day with the game more interesting. At least he had a positive K/D ratio , but what about SD’s? My Black Doom Award is Lucas. WHY did they have to include him? Mother 3 was never released here! It’s like holding a water bottle just out of reach of a dying man. A dying man with rabies. My Black Doom Award is Lucas. WHY did they have to include him? Mother 3 was never released here! It’s like holding a water bottle just out of reach of a dying man in the desert. I like Lucas – He’s a very different version of Ness. Lucas’s PK Thunder doesn’t die when you hit something the first time. It just keeps going and going. The other thing I like a lot about brawl is (weather by tweaking or by the new physics engine) that a lot more of the characters I find more playable. Like in the original smash, Link and Ness were my favorites to play, but in Melee, they became too cumbersome – Link was too heavy and slow while Ness just wasn’t shooting his PK Thunder the way he used to. Now in Brawl, I find them more agile and better to play again. Sheik (my Melee strong suit) handles differently though – she charges her needle shot, which takes some getting used to, but does make it more usable. Also Sonic Adventure 2: Battle let you skin your menus. I like Lucas, he’s one of my regulars . Subspace Emissary is soooo long. I’ve put in more than 5 and a half hours and I’m barely 60% through >.< . Anyone finish it yet? And when are we gonna be able to say spoilers without fear? A week or two? Subspace Emissary is soooo long. I’ve put in more than 5 and a half hours and I’m barely 60% through >.< . Anyone finish it yet? I haven’t beat it yet either. That % complete has to do with doors you’ve gone through and items you’ve collected, not necessarily the amount of story that you’ve traversed. I think I’m right at the end. The level is called “The Great Maze,” and when I realized what it was I saved and quit. Not ready to tackle that quite yet…..
@Ray: I know about the percentages etc, but usually in games with percentages like that you’d usually reach the end at about 75-85%. Oh well, I might finish it today if I feel up to it, especially since I need to beat it in order to go back to certain stages and unlock 2 of the 3 secret characters remaining. And yeah Ray, you’re at one of the last, if not the last, stage. Actually I think I’m there too. Show ? I can’t believe I still haven’t unlocked Jigglypuff yet either >.< , she’s the third one I need. haha, I almost can’t believe I said that. Heh. Song: Smash Smash Bros (N64) – Victory music. Example: End of a multiplayer match, played after the character victory sound effect. As for Brawl, I think I may fail my Calculus exam tomorrow because of this game. Oh wells. 😀 Now to complete a Friend Code database keeper and sharer.. which wouldn’t need to be created if there wasn’t just one single friend code… Huzzah for PHP and MySQL. Huzzah indeed. The trivia from last week is Super Monkey Ball 2’s “Monkey Target 2” mini game! I’d been racking my brain over it cause I knew it, but I couldn’t place my finger on it. Yay me, personal win . Oh yeah a little defense to the voice-acting is that it if youve played either Fire Emblem: Path of Radiance or Radiant Dawn you would know its sorta in Ike’s character to say “I fight for my friends”. You should play them, they’re great. Oh, and Lucario has the best voice…Period. Forgot to mention that most of the voices are done by the actors who played them in the original game. I noticed this with Ike, Link, Lucario (from the movie), and the pokemon trainers pokemons. ( all done by the same people form the original anime) cool huh? Umm, I know the answer to the trivia and I sent an email the day the podcast came out… sooo??? I thought you were crazy at first when you guessed it, but I decided to go back and listen to the game you mentioned (on some YouTube videos), and it is very similar to this music. However, it’s not the right answer. We’ll announce the winner in the next podcast. Thanks! Why does everyone think Dedede is obscure?